HL Training Services offer a wide range of forklift operator training courses for both individual candidates and businesses, and deliver in-centre training for selected forklifts (see full selection below) and onsite training for all types of forklift trucks. Our courses take place throughout South Wales, Melksham and further afield, covering all skill sets from novice to refresher courses. The course schedule enables the candidate to learn basic operating skills and safe working practices and includes a basic operator practical test and theory test. Course lengths may vary due to onsite training facilities, group numbers, machine types and in house training requirements. Below is the recommended training days for a group of 3 candidates. Benefits of on-site training include; training on the machine the candidate will be using, training on companies load specific operations, training can be conducted during quieter days to avoid losing workforce completely during busy periods, weekend training is available, we can issue in house certificates to companies or restricted certificates specific to site requirements and operations, which means the certificate is not valid outside of the company or specific premises. 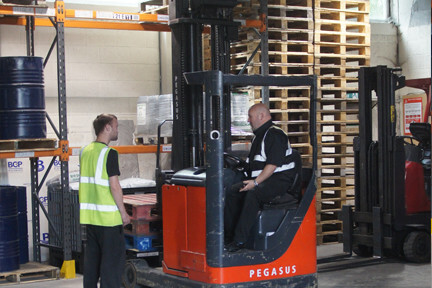 HSE Lift Truck Training Guide for Employers: For important information View Here, Also available as a free download from the HSE website.